That frustrating feeling of having a viable solution — but being cast aside — was probably how many of us in the satellite industry were feeling at the recent C4ISR Conference. 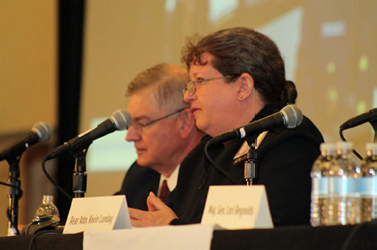 The C4ISR Conference brought private industry together with the military decision makers responsible for the DoD’s Command, Control, Communications, Computers, Intelligence, Surveillance and Reconnaissance (C4ISR). 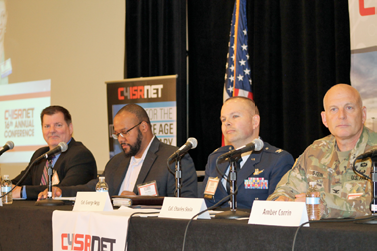 The conference featured a number of panel discussions and keynote speeches that featured a mix of representatives from both the private and public sector, and that focused on the IT, cybersecurity and communications challenges facing today’s military. • A need for a mobile communications solution that could deliver high throughput connectivity to a location quickly and without military personnel having to plug into existing transoceanic fiber. • A need to ensure secure communications in theater, at a time when adversaries are actively working to take away one of the US military’s largest advantages — its communications and real time intelligence capabilities. 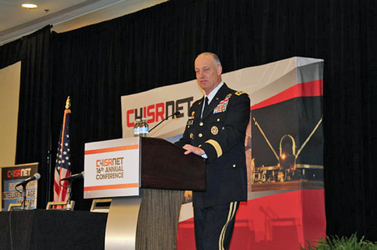 The first of these needs was expressed by Lieutenant General Alan R. Lynn, the Director of the Defense Information Systems Agency (DISA) and Commander of the Joint Force Headquarters - Department of Defense Information Networks (DODIN) out of Fort Meade, Maryland. Prior to beginning the Q&A portion of his presentation, the General discussed what the military need from its industry partners. What comes next could very well be satellites. Long perceived as a slower alternative to terrestrial networks and fiber, satellite communications have come a long way thanks to new satellite technologies and innovative new satellite constellations. Today, Medium Earth Orbit (MEO) and Low Earth Orbit (LEO) satellite constellations are being launched that drastically reduce latency thanks to their closer proximity to the Earth. These constellations offer fiber-like connectivity and throughputs from space, meaning that they can deliver bandwidth similar to a terrestrial network anywhere within their constellation’s coverage area — and these constellations cover a large portion of the Earth. Furthermore, these satellites can deliver that bandwidth to any location with the requisite satellite terminal and antennas, meaning that a bubble of connectivity can be created, even without connections back to existing fiber networks. However, MEO and LEO constellations aren’t the only solutions that can offer high bandwidth anymore. The next-generation of satellites — known in the industry as high throughput satellites (HTS) — is capable of delivering just what its name promises — high bandwidth from geostationary (GEO) orbit. These satellites — which use concentrated spot beams to deliver high bandwidth connectivity — are being launched across many satellite providers today, with some already in orbit, and a large number slated to launch in the very near future. The second pain point or challenge that was mentioned numerous times at the event was the need to ensure communications at the edge, where enemy combatants and adversaries would be looking to deny or degrade them to eliminate our military’s network connectivity and IT capabilities. There was an overarching sentiment that the military should be prepared to fight in environments where IT solutions and capabilities weren’t available in theater. This was reflected in comments by Rear Adm. Danelle Barrett, Director of the Navy Cyber Security Division in the Office of the Chief of Naval Operations, during a panel focused on security. Fighting through the hurt, it’s becoming clear that we’re going to have to do that,” Rear Adm. Danelle Barrett, Director of the Navy Cyber Security Division in the Office of the Chief of Naval Operations. This is another area where satellite could be beneficial. The sheer number of satellites in orbit — between the military’s WGS satellite constellation and commercial communications satellites — delivers the redundancy and resiliency needed to ensure that essential communications aren’t lost in theater. The new generation of HTS doubles down on the ability to deliver assured communications through the use of harder-to-jam spot beams and other built-in security advancements. Ultimately, even in a more contested space domain and environment, new technologies could make satellite a more resilient way to deliver fiber-like connectivity to the battlefield. Despite this, satellite seemed like an afterthought for many of the speakers and panelists, many of which were lamenting the same challenges that satellite can help the military overcome. “Fighting through the hurt, it’s becoming clear that we’re going to have to do that,” Rear Admiral Danelle Barrett, Director of the Navy Cyber Security Division in the Office of the Chief of Naval Operations. If this past C4ISR Conference was aimed at those in the satellite industry that felt overlooked, there could be some relief on the horizon in the form of the Air Force’s wideband analysis of alternatives — or AoA. 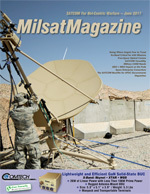 As discussed in the past, the AoA will help the Air Force establish a new path forward for the military when it comes to how it acquires and uses satellite services, and the advanced MEO and HTS satellites that are being offered by commercial satellite providers could see their role in military communications increase as a result. Colonel George R. Nagy, the Chief of the Space Support to Operations Division within the Office of the Deputy Under Secretary of the Air Force for Space, was met following his participation on the space panel and was asked why he felt these new satellite technologies weren’t being mentioned as solutions for the challenges facing today’s military. In early March, there was some major news announced by satellite communications company Intelsat — the company was to receive a cash infusion from SoftBank and then combine with OneWeb in a share-for-share transaction. This deal has now dissipated. However, the concept of a satellite communications provider with GEO satellite constellations purchasing or merging with a smaller satellite provider using satellites closer to Earth to deliver high throughput, low latency connectivity, is not really new. SES managed this action when they invested in — and then later acquired — O3b Networks, a satellite communications provider that operates a constellation of MEO satellites. O3b’s satellite constellation augmented the existing GEO constellation that SES already had in orbit and gave the company the ability to offer customers fiber-like connectivity anywhere on Earth that a satellite could place a beam. This is starting to look like a trend in the industry. But why? The beauty of MEO and LEO satellite constellations is their ability to deliver extremely high throughputs and incredible bandwidth through their use of concentrated spot beams. Their closer proximity to the Earth also allows them to deliver that bandwidth with much less latency, in contrast to a GEO satellite constellation. This may not seem like as big of a deal with the next generation of HTS coming on line, which also use spot beams and offer higher bandwidth. However, there are still differences between what HTS offers and what MEO and LEO constellations offer. Although HTS satellites deliver higher bandwidth, they’re still positioned in GEO, far away from the Earth’s surface. The physical location — less than half the distance from Earth as GEO — ensures that MEO will always be lower latency than even HTS satellites. Then there’s the issue of flexibility. Although GEO HTS satellites use spot beams — much like MEO and LEO satellites — commercial satellite communication providers don’t have same ability to navigate or ‘re-assign’ those beams to exactly where their users need them. Ultimately, by augmenting existing GEO satellites with MEO and LEO constellations, these providers are giving their customers the benefits of one system or another — or both — based on what their particular needs are and which system will best do the job. The US government is the perfect example of a customer that can benefit from both. Even better, thanks to the strategic mergers and acquisitions, customers can now get that flexibility all from one provider. Who really benefits? The end user. Especially government end users. Today’s military is vastly more dependent on IT services and capabilities than ever before. 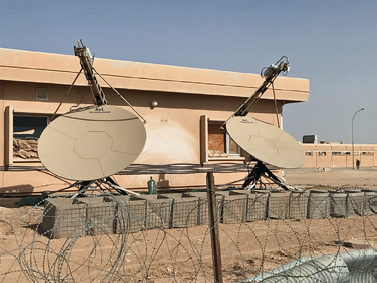 High throughput, low latency COMSATCOM connections in theater are essential for the military when fiber-like connectivity and latency is required, but fiber simply isn’t available. That being said, not all military operations and troop positions will require the same level of service and same amount of bandwidth as others. For forward operating bases and other troop locations where a large amount of bandwidth is needed for both official military communications and operations — as well as the personal use of warfighters in theater — a MEO spot beam can be ‘dropped’ into the base and deliver high-density, fiber-like connectivity capable of handling terabytes of information. Ultimately, when COMSATCOM providers augment their GEO fleets with MEO and LEO constellations, they give their military and federal government customers the flexibility to use the correct solution in the appropriate situation through a trusted provider and partner with whom they already have a relationship. The existing relationship is really key, as that makes it easier and faster for the government to acquire and use these services. Then there’s the ever-important issue of security. In an era where space is an increasingly contested environment and the nation's adversaries are working to compromise space capabilities, the military now has to consider space a warfighting domain and protect satellite resources. Disaggregating, proliferating and distributing military communications across both commercial and military GEO satellites helps provide increased resiliency and makes it harder for adversaries to target military communications. Further disaggregating military communications across both GEO and MEO can foster additional resiliency and redundancy and help ensure space capabilities are always available to the warfighter in theater. The combination of LEO, MEO and GEO satellite systems is a trend that will most likely represent the future of the COMSATCOM industry — and the government is poised to benefit. The preceding articles are republished courtesy of The Government Satellite Report (GSR) and Executive Editor Ryan Schradin. Ryan is a communications expert and journalist with more than a decade of experience and has edited and contributed to multiple, popular, online trade publications that are focused on government technology, satellite, unified communications and network infrastructure. His work includes editing and writing for the GovSat Report, The Modern Network, Public Sector View, and Cloud Sprawl.